When I was planning our menu last week, I realized we hadn't had spaghetti in quite a long time, and that was just unacceptable. We're simple people, and spaghetti and meatballs is one of our favorite meals to eat. I knew I had to put it on the menu this week, but I also wanted to get a little bit creative. Typically I make my meatballs with hot Italian sausage, but since Andrew can't handle really spicy foods quite yet, I wanted to find an alternative. I could have made these again (which are delicious), but then I saw this post from Cake, Batter, and Bowl and a lightbulb went on. 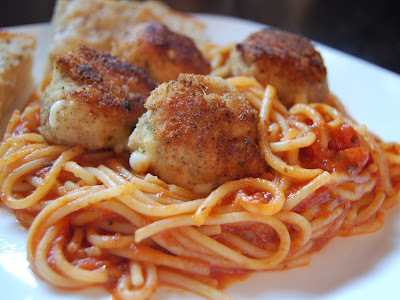 Chicken parmesan meatballs! What an ingenious idea. I took my inspiration from the post I linked to above, but I did my own thing with the recipe. I just winged it, and we all absolutely loved how these turned out. These meatballs taste exactly like little servings of chicken parm. I was initially going to put a small piece of mozzarella cheese in the center of each meatball, but to save time I opted to mix the mozzarella directly into the meatball mixture. I used about 3 pieces of chopped string cheese (I know, I know, but Andrew loves it and we always have it in the house), but you could also used chopped fresh mozzarella or shredded cheese. This is a very versatile recipe, and these meatballs are beyond delicious. They were the perfect topping for our spaghetti! 2. Heat a small amount of olive oil in a large skillet over medium heat. Add onion and garlic and cook, stirring frequently, until onion is softened. 3. Add cooked onion and garlic, ground chicken, parsley, Italian seasoning, red pepper flakes, salt and pepper, mozzarella cheese, 1/4 cup breadcrumbs, and 1/4 cup parmesan cheese to a large bowl. Mix just until combined. Shape into balls. 4. In a separate bowl, combine the remaining 1/2 cup breadcrumbs and 1/4 cup parmesan cheese. Heat enough olive oil to coat the bottom of the same large skillet used for the onion and garlic. Roll the meatballs in the breadcrumb and parmesan cheese mixture. 5. Add meatballs to skillet and cook in batches until all sides are well-browned, adding more olive oil as necessary. Transfer meatballs to a cookie sheet and finish baking in the oven, 7 to 10 minutes, depending on the size of the meatballs. I loved the sound of these on Kerstins blog.. thanks for reminding me to try them. Looks great, Cassie!